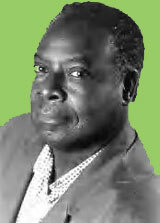 At its 1993 meeting in Guadeloupe, the Executive of the African Literature Association resolved that the Award be conferred regularly at the annual meetings of the ALA.
Dr. Emmanuel Dongala, distinguished visiting professor of Chemistry at Simon’s Rock College of Bard, Great Barrington, Mass., delivered the keynote address at the Sixth Annual Conference of the Mid-America Alliance for African Studies. Born in Brazzaville, Congo, Dongala has studied at Oberlin College and Rutgers University in the United States. He holds a doctorate in stereo chemistry from the University of Strasbourg, France, and a doctorate in polymer chemistry from the University of Montpellier, France. Prior to his departure from Brazzaville in 1998 due to the uncertainties and ravages of civil war, he was Dean of Students and Chair of the Chemistry Department at the Université de Brazzaville. In addition to his academic career as a chemist, Dongala is the author of three award-winning novels and a collection of poetry. For his latest novel, Les petits garcons naissent aussi des ètoiles (Boys are Also Born from Stars), published in 1998, he is the recipient of Radio France International’s Temoin de Monde award. This award was established in 1997 to honor literary works that contribute to a better understanding of world problems. His first novel, Un fusil dans le main, une poeme dans la poche (A Gun in Hand, a Poem in the Pocket), published in 1973, won him the Ladislas Domandi prize for Best French novel by a nonresident of France. His second novel, Le feu des origines (The Fire of Origins), won the Grand Prix de la Fondation de France and the Grand Prix Literaire d’Afrique Noire. His literary works have been published in seven languages. He is president of the Congolese PEN and of the National Association of Congolese Writers, and has been appointed a Chevalier des Arts et des lettres. Dr. Dongala was awarded a Guggenheim Fellowship in 1999, which he is using to travel throughout Africa in preparation for writing his fourth and most ambitious novel. Concerned about the plight of Africa’s children, he plans to write about their difficult and painful circumstances of life through the eyes of two young Africans. Julia Michaels of the Boston Globe has written that Dr. Dongala is “in great demand on the American college lecture circuit.” The MAAAS constituency is truly fortunate for the opportunity to sponsor such a noted educator and literary author as the keynote speaker at our 6th Annual Conference.